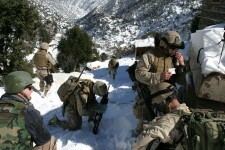 “During Phase I the Battalion held planning conferences to coordinate efforts involving the Intelligence Fusion Cell to afford real time Signal Intelligence (SIGINT) feeds; completing target folders; determining the best time(s) on target(s) based on pattern analysis and aircraft capabilities/limitations; identifying the best Landing Zones (LZs) to afford tactical advantage; and completing the Information Operations (IO) and Civil Affairs (CA) plans for Phase III. Phase I ended as the Battalion staff and attachments positioned for command and control and execution of the operation. On 25 January, India Company hosted Major General Eric Olson, Commanding General Combined Joint Task Force (CJTF) 76. General Olson received a brief on Operations SPURS and spoke with the Marines from India Company before they inserted for the operation. Weather delayed Phase II until the end of the month. Phase II began on 27 January began with the helicopter insertion of two reinforced platoons from Lima Company and one reinforced platoon from India Company into the Korengal, Pech, and Rechah Lam Valleys. Phase II provided valuable SIGINT from the ground and from the airborne Low Level Voice Intercept (LLVI) as well as substantial amount of human intelligence (HUMINT). Although active sensitive collections did not work as planned, passive sensitive collections gathered sufficient current target location information to make targeted detentions viable. Phase II of the operation coincided very closely to the planned execution checklist and all assets [Task Force (TF) Pirate, the aviation task force, Navy Special Operation Forces (NAVSOF), and the Intelligence Fusion Cell] made valuable contributions to the successes achieved during this phase. Task Force Pirate’s work to land Marines and insert NAVSOF in exceptionally difficult terrain, to include tail down and fast rope insertions, was noteworthy. Phase III of Operation SPURS commenced with targeted Civil Military Operations (CMO). Combined Task Force (CTF) Trinity conducted three separate Medical Capabilities (MEDCAP) events and winter CMO supply distribution missions in the Pech and Korengal Valleys while concurrently conducting security patrols. Participation from the local populace was exceptional as an estimated 500 people benefited from the services provided. Of the participants, nearly 30 females took part. Engagement with village elders and mullahs met with positive feedback and they expressed their desires to rid the Korengal Valley of AQAM influences. All supporting agencies remained flexible and adaptable. The combined efforts of TF Pirate and NAVSOF provided a continuous aerial Quick Reaction Force (QRF) capability through the night as well as fixed wing Close Air Support (CAS) capability. The 23rd Kandak performed critical tasks during Phase III and was the focus of effort for Phase IV. 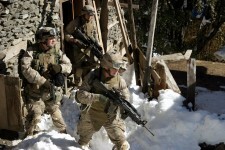 Phase III of Operation SPURS ended and Phase IV began as the two Marine companies, NAVSOF and the Tactical Command Post (TAC CP) were extracted and the ANA assumed the duration presence mission in the Korengal Valley. In addition, the numerous reports prior to Operations SPURS that indicated a large-scale attack on FOB Asad Abad during the same time period never materialized. Instead, it became clear from all reporting that the AQAM became reactionary to “Americas Battalion” and not vice versa. Along with the continued ANA presence, local radio stations broadcasted information throughout Kunar Province, persuading the local populace to provide information on enemy activities and encouraging low to mid-level fighters to lay down their arms and assist in the reconstruction process. 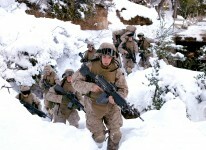 KUNAR PROVINCE, Afghanistan, Feb. 7, 2005 — “America’s Battalion,” 3rd Battalion, 3rd Marines, completed Operation Spurs this week as part of a combined Coalition and government of Afghanistan offensive against terrorist threats in Afghanistan during the winter months. Leaping from CH-47 Chinook helicopters hovering just above the jagged, snow-covered mountains that ring the Korangal Valley, Marines from both India and Lima Companies inserted into different parts of the valley; they quickly cordoned and searched several houses believed to be hideouts for mid-level Taliban and terror organization Hizb-I Islami Gulbuddin (HIG) leaders and fighters. 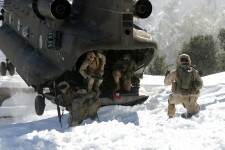 With helicopter pilots performing precarious two-wheel landings over the treacherous mountain terrain and the Marines and Sailors willingness to eagerly take the fight to the enemy no matter the “clime or place,” America’s Battalion sent a clear message that security threats to Afghanistan will not be tolerated or allowed to remain in the Korangal Valley. 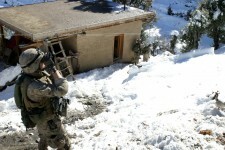 The battalion has maintained its high operational tempo despite harsh weather conditions, in an effort to disrupt the activity of anti-government forces here during a time when Taliban and Al Qaeda elements operating in Afghanistan have, in the past, taken time to reorganize and recuperate. 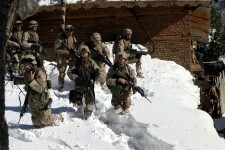 Insurgents preparing for renewed attacks on Afghan and Coalition targets in the spring, using heavy snowfall and plummeting temperatures to mask their activity, will continue to be sought out by Marine-driven initiatives throughout the harsh Afghan winter said 3rd Battalion, 3rd Marines Commander, Lt. Col. Norm Cooling. “Regardless of how difficult the terrain and weather might be, we have the training, equipment and commitment to take the fight to those continuing to sponsor and conduct terrorist activities in the Kunar Province and that is precisely what we are doing. We are not going to sit around and worry about them exploiting the local populace and attacking us. 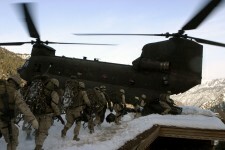 We are going to keep them worried about us bringing the attack to them,” said Cooling. If insurgents hiding there were distressed to see the arrival of the Marines, many residents of Korangal happily welcomed the Marines and Navy Corpsmen of the battalion. With the assistance of Afghan doctors, soldiers from the Asadabad Provincial Reconstruction Team, and female military police officers from the 58th MP Company, 25th Infantry Division, they distributed winter coats, medication and offered medical help to nearly 500 sick villagers and their children throughout the Korangal area. Several Lima Company Marines also met with the Korangal village elders, who expressed thanks for the medical supplies and coats. One of the elders, who fought the Russians with the mujahedeen, said that the new peace in Afghanistan was a welcome change and he looked forward to a time when it wouldn’t be necessary for Marines and the Afghan National Army to look for terrorists in his village. “We are happy to have the security here and to receive the medical attention you provide us,” said one of the elders who hosted the Marines for a meal in his home. Coalition forces hope to further solidify support among the village elders of the Kunar province by continuing to improve conditions there and eliminate the threats they face from insurgents. Operation Thunder Freedom continues as America’s Battalion and Combined Joint Task Force 76, in conjunction with the government of Afghanistan, assess and seek to eliminate threats along the Afghan-Pakistan border. KORANGAL VALLEY, Afghanistan – It was a heartwarming feeling of relief for the hospital corpsman as he looked down at the infant in his arms. He knew that a diagnosis of pneumonia would normally have been a death sentence for the crying baby, several days’ journey along treacherous, snow-covered roads from the nearest medical facilities. This time, however, with medical supplies and expertise provided by the Afghan Government and Coalition forces, the child would get a second chance at life. As part of Operation Spurs, Navy Corpsmen and Afghan Medics, along with a couple thousand pounds of humanitarian assistance and medical supplies, made their way via helicopters to three separate remote villages in the Korangal Valley area to provide medical care to nearly 500 Afghans. Having Afghan medics working with the Marines and Sailors was important on many levels. Making sure that Afghans from the largest cities to the smallest mountain communities know that it’s their government acting to better their lives is extremely important for Coalition Forces. Besides medical supplies, the Marines and Sailors also passed out toothpaste, soap and heavy winter coats. As Operation Thunder Freedom progresses though the Afghan winter, Marines and Sailors will have many more chances to interact with and supply humanitarian aid to Afghans in the remote mountain villages.